During the reign of Maximian, there lived in the city of Heliopolis a nobleman by the name of Dioskor. This man was renowned for his wealth and standing in the community as an uncompromising pagan. He was also a widower who focused all his attention on his only child, Barbara. Dioskor cherished her above else, as she was virtuous, intelligent and grew more beautiful day by day. His desire to protect her from the presence of common folk was such that Dioscor had a tower built and locked Barbara away in it. There she lived in great luxury, surrounded by a host of worthy attendants who guarded her from the world and taught her pagan worship. Barbara lived for a while like this without complaint, and spent much of her time observing the natural world surrounding her tower home. Soon she began to ponder the creation of all she beheld in nature, and deduced that no pagan idol could be responsible for all it’s beauty. Then one day, the Grace of God illumined her heart to the understanding of the one true God, the unseen and wise Creator of heaven and earth. From that time forward, Barbara was determined to live her life in virginity and devote her life to God. By now, Barbara’s beauty had become legendary throughout the land and many noblemen begged Dioscor to marry her. But Barbara steadfastly refused every proposal and warned Dioscor that she would kill herself if he pressured her to marry. Horrified at this prospect, Dioskor changed tact and allowed his daughter the freedom to come and go from the tower at will, thinking she would change her mind about marrying once she met with newly engaged and married women. Soon after, Dioskor departed on a long journey, and left explicit instructions with his household regarding the construction of a bathhouse, and the new arrangements concerning his daughter. Barbara was now permitted to venture wherever she liked, and to meet with whomever she wished. Before long, she heard the name Jesus Christ from new acquaintances, and wanted to know more about Him. She sought the knowledge about God and faith in Christ from a presbyter disguised as a merchant from Alexandria. The presbyter instructed Barbara on the mysteries of the faith and then baptized her. While her father was still away, Barbara visited the bathhouse, and with the fervor of her newly found faith, persuaded the builders to make three windows in the structure to honor the Holy Trinity, instead of the two her father ordered. Then, she went to admire the marble pool close by, and drew the sign of the cross on the stonework with her finger, leaving an imprint as though it were carved. Barbara was so virtuous, even her footstep was imprinted in the rock outside the bathhouse, where a healing spring of water emerged and continued to flow for hundreds of years after. When Dioskor returned home from his journey, he discovered the changes made to the bathhouse and angrily rebuked the builders for disobeying his orders before he learned about Barbara’s involvement. When he did confront Barbara about the changes, she replied the third window was made in honor of the Holy Trinity which illumines every human heart. Bewildered by his daughter’s response, Dioskor took Barbara aside to the marble pool, and asked her how the light from three windows could illumine every human being. Barbara told him that the Father, Son and Holy Spirit dwell within every person, and that each of the three windows she had built glorified the name of the Holy Trinity. She then showed him the cross imprint in the marble and explained it was a sign of how the Son of God suffered freely for the salvation of humanity. When Dioskor heard this, he became enraged, forgot all love for his daughter, and unsheathed his sword to strike her. But Barbara fled before he could harm her, and begged for God’s help. With her father in hot pursuit, she ran into the countryside where a fissure in one of the mountains parted for her escape. There she hid in a cave, while her father continued to search for her. After a long time, Dioskor came upon two shepherds; one denied seeing the girl, the other silently pointed the way to Barbara’s hiding place. When Dioskor found his daughter, he ruthlessly beat her, locked her up under guard and refused her food and drink. In the end, he decided the only way to revert her to idol worship, was with the help of the procurator, Marcian. When Barbara was held in front of Marcian, her exceptional beauty and strong conviction amazed him. So he began by speaking to her gently, complimenting her loveliness and reminding her about her wealthy inheritance if she obeyed her father. But when he heard her reject all earthly treasures and cares for the one True God, Marcian ordered her stripped, tortured and had her wounds rubbed with all manner of sharp and stinging objects. She was thrown into a dungeon barely alive, yet Barbara prayed tearfully for God to strengthen her will in bearing all agony. Her prayers were answered, for at midnight Christ appeared to her in a great ray of light. He healed her wounds, and filled her heart with such joy, that she was encouraged to endure to the end all torment. When Barbara faced Marcian a second time, no trace of violence could be found on her body, and she appeared more radiant and beautiful than before. Again the procurator began to entice her kindly, but grew furious when she refused to deny her faith in God. Once more Barbara was subjected to the most injurious cruelty even the strongest man could not endure. Among the crowd gathered to witness Barbara’s torture, was a young Christian woman by the name of Juliana, who also desired to suffer for Christ’s sake. She loudly denounced the procurator’s judgment, and was tortured along side Barbara. The two women were finally led to their place of execution, where Juliana was put to death by a soldier, while Barbara was beheaded by her own father. Dioscor, however, was not to outlive his daughter by much, for that very day both he and Markianos were to die suddenly by a bolt of lightening. Holy and Great Barbara’s martyrdom occurred in 306. A pious man, Galentain, recovered the bodies of Barbara and Juliana, buried their remains and erected a church in their memory. Today the wonderworking relics of St. Barbara rest in St. Vladimir’s Cathedral, in Kiev. They were brought there from Constantinople, in 1108 by the Byzantine Princess Barbara when she married Prince Michael Izyaslavitch. We celebrate St. Great Martyr Barbara’s feast day on December 17, according to Julian calendar. 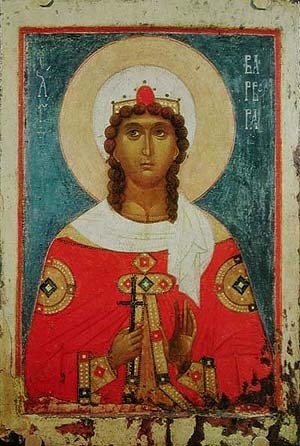 O Holy Great Martyr Barbara, pray unto God for us!